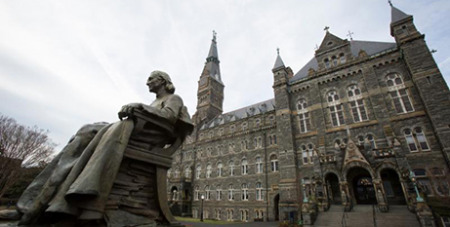 Georgetown University students in Washington DC have voted in favour of a reparations fund to repay descendants of slaves sold by the Catholic university in 1838. Source: BBC News. A “reconciliation contribution” fee of $37.92 (US$27.20) each semester would benefit descendants of the 272 slaves. Georgetown is the first major university to pass such a reparations fund. The student-led referendum was organised by the group Students for the GU272. The university’s elections commission reported that nearly 60 per cent of students turned out to vote last Thursday. If approved by the university board, the fund will go towards “charitable purposes” benefitting the descendants of those slaves, many of whom now live in Louisiana and Maryland. In 1838, the Jesuit university decided to sell the slaves to plantations in Louisiana to pay off debts, in a deal worth the equivalent of $4.6 million (US$3.3 million).